Effective States » From schooling to learning: Is Uganda committed to increasing the quality of basic education? From schooling to learning: Is Uganda committed to increasing the quality of basic education? Developments in the Ugandan education sector since 1996 paint a picture of increased enrolments, but little or no improvement in quality, despite several policy initiatives and an apparent policy consensus that initiatives to improve quality are important. Studies on education reforms in Uganda tend to take the education policy process for granted. They do not deal with how improved education becomes part of a political agenda or the politics behind how initiatives are implemented and sustained once they are introduced. 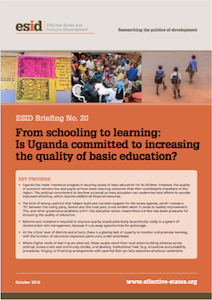 This briefing paper asks whether Uganda is committed to increasing not only access to basic education, but its quality.